This was a CD-ROM that came packed with images from the original Gatchaman series. The main purpose of it was to allow you to use the images on such various things as envelopes, stickers, homemade calendars, computer diskettes, etc. In addition to the images, there were a number of scans of animation cels, rare sketches, and a video with the Gatchaman TV series opening animation and theme song. 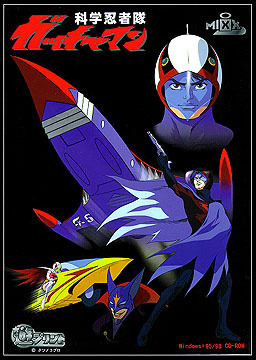 The first editions of this CD-ROM came with a small brown plastic leather-like wallet, embossed with the the "Science Ninja Team Gatchaman" logo.